The main objective of this study is to classify landforms within a watershed using advanced spatial statistics and image processing algorithms to identify and extract local geomorphometric properties of Digital Elevation Models (DEMs) with 20 m resolution. This study presents a customized GIS application for semi-automated landform classification based on Topographic Position Index (TPI). By using TPI, the landscape was classified into both slope position and landform category. Landform categories were determined by classifying the landscape using 2 TPI grids at different scales (neighborhoods: a 50 m radius and 450 m radius). Four slope position categories and 10 landform categories were generated. Important environmental gradients obtained from the DEM in this study are slope direction (Aspect), slope position, slope shape (planform curvature), topographic moisture index and stream power index. These gradients were then used to identify thresholds for classification of crests, flats, depressions and slopes. This study shows that DEMs offer many more potential habitat descriptors than simply a set of elevation values. Terraces, river captures and karstic closed or open depressions, which are frequently found in the landscape of the study area, were represented with TPI. The classification results can be used in applications related to precision agriculture, land degradation studies and spatial modeling applications where landform is identified as an influential factor in the processes under study. Sermin TAGIL and Jeff Jenness, 2008. 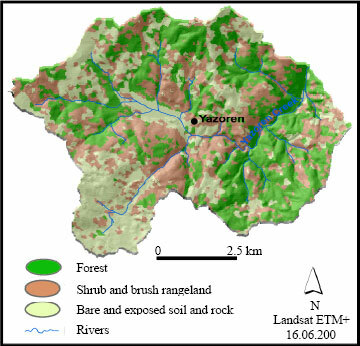 GIS-Based Automated Landform Classification and Topographic, Landcover and Geologic Attributes of Landforms Around the Yazoren Polje, Turkey. Journal of Applied Sciences, 8: 910-921. Geomorphometry, or simply morphometry, provides a quantitative description of the shapes of landforms and is derived using a combination of mathematics, engineering and more recently, computer science. According to Blaszczynski (1997), landforms are defined as specific geomorphic features on the earths surface, ranging from large-scale features such as plains and mountain ranges to minor features such as individual hills and valleys. A topographic position such as a hilltop, flat plain, valley, etc., is intuitively important for physical and biological processes acting on the landscape. Natural habitats of plants, erosion potential and solar radiation are directly related to landform patterns and the relative position with a landform (Blaszczynski, 1997). In the past, geomorphometric properties have been measured by calculating the geometry of the landscape manually (Horton, 1945; Miller, 1953; Coates, 1958). Unfortunately, measurement of such properties from topographic maps can be time consuming. In the 1960s and early 1970s, the generally availability of computers made possible more complex, statistically-based methods to identify landscape features (Chorley, 1972; Evans, 1972). More recently, advances in computer technology, increased processing power, new spatial analytical methods and the increasing availability of digital elevation data have re-oriented geomorphometry (Pike, 1999) and promoted the development of computer algorithms for calculating and discriminating geomorphometric properties of the Earths surface. Digital Elevation Models (DEMs) or Digital Surface Models (DSMs) are digital representations of topography or terrain and have been in use since the early 1970s. DEMs and derived data sets (slope, aspect, surface area, hydrographical pattern and shaded relief) have been exploited by investigators for geomorphologic and geomorphometrical studies (Franklin, 1987; Skidmore, 1989; Ventura and Irvin, 2000). Nowadays, terrain analysis is one of the more interesting and engaging types of geographic analysis in order to describe topographic position (Speight, 1990). Terrain data, when used in conjunction with multispectral imagery, also provides rapid and useful information on landscape geology, lithology, soils, land use and landcover, lineaments etc. The drainage basin, or watershed, is the fundamental unit in geomorphology. This study focuses on the upper part of the Kozdere basin, which includes Yazoren polje, due to its large variety of topographic features (Hosgoren, 1981). The main objectives of this research are to semi-automatically identify and classify the landforms within the watershed by applying advanced spatial statistics and image processing algorithms to DEMs. Morphometric techniques described in this paper are used to measure and mathematically model the Earths surface and provide objective and quantitative descriptions of landforms (Bates and Jackson, 1987; Denizman, 2003). The study area is located in Marmara Region in Turkey between latitudes 39°17N and 39°22N and longitudes 27°44E and 27°53E (Fig. 1). It includes the settlements of Yazoren-Urbut (Fig. 1, 2). The total basin area is ~44.2 km2 and the average elevation is ~380 m above mean sea level. This area experiences a strongly seasonal Mediterranean climate. Summers are quite hot and dry while winters are warm and wet. According to the Balikesir meteorological data, the average temperature is nearly 14.5°C and the total amount of rainfall in a year is 545 mm (Tagil, 2004). The geomorphology of the area reflects Alpine and post-Alpine tectonic activity. The Yazoren-Urbut graben basin separates the existing mountains. Field surveys revealed that land cover is extremely heterogeneous due to the large variety of adjacent topographic features. For instance, cultivated areas alternate with non-cultivated and natural lands are mixed with crop cultivations (Fig. 2). Caltepe formations and Yuntdag volcanics are widespread in the region, while Akcakoyun formations are seen on only a small part of the study area. These three formations occupy most of the mountainous portion of the region. The Caltepe Formation, formed during the Upper Triassic period, is the oldest autochthonous unit in this area and consists of limestone originating in subduction-accretion units of the Palaeo-Tethys Ocean (Tekeli, 1981; Ercan et al., 1990; Fig. 3). The Caltepe Formation is overlaid by sandstone, mudstone and limestone from the Early Cretaceous Akcakoyun formation. The Akcakoyun Formation is unconformably overlaid by the Yuntdag volcanics from the Late Miocene to Pliocene. The Yuntdag volcanics cover a large areal extent and are composed of agglomerate and tuff. 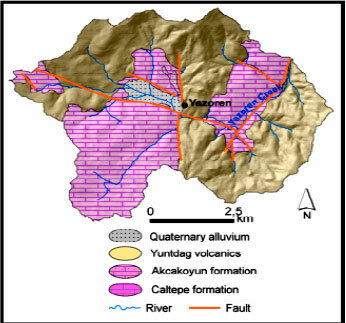 Quaternary alluvium is the most recent formation and is restricted to the valley bottom west of Yazoren. Input data: The data used in this study consists of: (a) topographic maps from the Turkish Military Geographic Service on a scale of 1:25,000 (Contour interval 10 m); (b) a Landsat Enhanced Thematic Mapper Plus (ETM+) satellite image taken on July 2, 2000 (spatial resolution: 28.5 m); (c) a geologic map from the General Directorate of Rural Services on a scale of 1:25,000; (d) a Digital Elevation Model (DEM); (e) GPS (Global Positioning System) data collected in the field by using a handheld GPS receiver. Nearest neighbor resampling was used to georectify the LANDSAT image to the Universal Transverse Mercator map projection (UTM Zone 35, WGS84) using 50 Ground Control Points (GCPs) with an RMS < 1 pixel. The GIS software programs ArcView 3.2 and ArcGIS 9.2 were used for the morphometric analyses. Data analysis was divided into two main sections: 1) digital terrain analysis, using general morphometric techniques to analyze the entire surface and 2) digital landform analysis, involving specific morphometric methods to examine particular landforms in the study area. DEM: DEM was generated by first digitizing 10 m interval contours from 1:25,000 Turkish Military Geographic Service topographic maps. Then, a 20 m DEM was interpolated from contour lines using the Topo to Raster tool in ArcGIS 9.2, which converts vector topographic lines to a raster DEM surface using the ANUDEM algorithm. Watershed delineation and study area: The drainage network, watershed and sub-watersheds used in this paper were delineated automatically from the DEM using the Arc Hydro tools of ArcInfo. 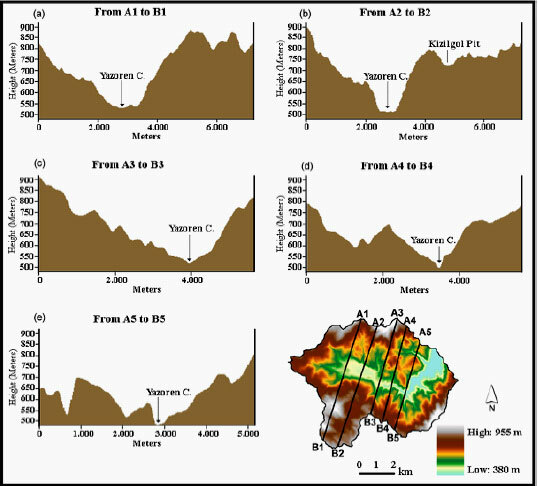 Flow direction, flow accumulation, stream definition, stream segmentation and watershed delineation were determined using standardized raster methods described by Djokic et al. (1997) and ESRI (1997). The raster analysis area in this study includes the study area watershed plus a 500 m buffer. This buffer is included to account for a common problem in raster analysis, in that many analytical functions require information from a neighborhood around each grid cell. When analysis is limited to the exact extent of the study area, then cells at the edge of the study area may not have complete neighborhoods available. The 500 m buffer used in this study guarantees that all grid cells will have a full neighborhood available when calculating neighborhood statistics. Landcover classification: Landcover was classified using the Guided Clustering method, which is a hybrid supervised-unsupervised classification approach outlined in Messina et al. (2000). A 3×3 median filter was applied to remove speckled pixels, random pixels in the middle of a main class and to refine the classified maps. Attributes were assigned to classes using GPS data, Normalized Difference Vegetation Index (NDVI), field knowledge, air photos and different band combinations. Three different landcover classes were extracted: forest, shrub and brush rangeland and bare exposed soil and rock (Fig. 4). The bare exposed rock and soil class also includes agricultural areas and built-up areas. The overall accuracy of the landcover classification was 80%. Morphometric analysis (Topographic attributes): The topographic attributes of slope, aspect, curvature (planform), topographic wetness and stream power were computed from the DEM (Fig. 5). Slope and aspect maps show the magnitude and direction of the vector tangent to the topographic surface pointing downhill at a point. Planform curvature, calculated using standard ESRI functions based on the algorithms of Zevenbergen and Thorne (1987), provides a measure of how water converges or diverges as it flows through the landscape. Planform curvature is calculated using a 3×3 cell neighborhood, so in our case it represents the curvature in a 60x60 m area. Planform curvature values were reclassed to concave, linear and convex based on the following criteria: if n‘0.1, the planform curvature is convex and flowing water will tend to diverge; if -0.1‘n<0.1, the curvature is linear and if n<-0.1, the curvature is concave and flowing water will tend to converge. In order to remove spurious features, the resulting wetness map and stream power map were filtered using the “majority filter” routine (3×3 scanning window). Topographic Position Index (TPI): Topographic Position Index (TPI) is the difference between the elevation at a cell and the average elevation in a neighborhood surrounding that cell. Positive values indicate that the cell is higher than its neighbors while negative values indicate the cell is lower. TPI is a simplification of the Landscape Position Index described by Fels and Zobel (1995) and was developed in detail by Weiss (2001). TPI values provide a simple and powerful means to classify the landscape into morphological classes (Jenness, 2005). The neighborhood size and shape is critical to the analysis and should be based on the scale of landscape feature being analyzed. To classify very small features like small streams or drainages, a small circular neighborhood was used. To identify large canyons or mountains, a large circular neighborhood was used. Choosing the correct neighborhood is generally an iterative process in which several options are tried before the most useful sizes are identified. In this study, TPI grids generated from 50, 100, 150, 200, 250 and 450 m neighborhoods was presented (Fig. 6). Slope position classification: Next, TPI values were used to classify the landscape into slope position classes. This classification is based on how extreme the TPI values are and by the slope at each point. Logically, high TPI values would be found near the tops of hills while low TPI values would be found in valley bottoms. TPI values near 0 would be found on either flat ground or somewhere mid-slope and slope values are used to distinguish between these two possibilities. In this study, a 4-category slope position grid from each of the 6 TPI grids was generated (Fig. 7). 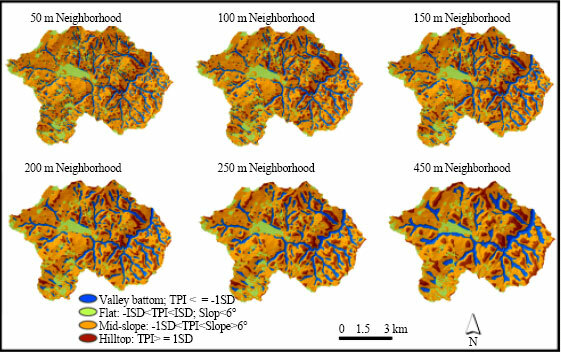 A TPI threshold value of ±1 SD was used to identify hilltops and valley bottoms, where the standard deviation value was calculated from all elevation values in the watershed analysis area. A slope threshold of ±6° was used to distinguish between flat areas and mid-slope areas (Table 1). 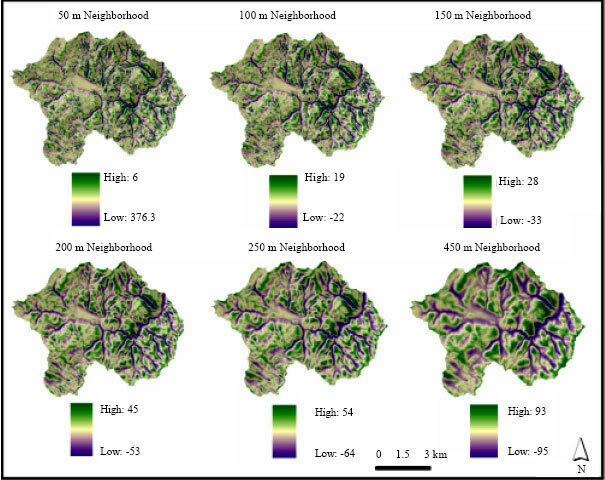 Landform classification: TPI values calculated from two neighborhood sizes provide more information about the general shape of the landscape than TPI values from a single neighborhood and therefore more complex landscape features can be identified by combining TPI grids generated at different scales. A point on the landscape with a negative small-neighborhood TPI value and a positive large-neighborhood TPI value is likely to represent a small valley on a larger hilltop. Such a feature may reasonably be classified as an upland drainage. Conversely, a point with a positive small-neighborhood TPI value and a negative large-neighborhood TPI value likely represents a small hill or ridge in a larger valley. In our case, 50 and 450 m TPI grid, in combination with slope were used and classified landforms using criteria described by Weiss (2001) (Fig. 8; Table 1). As with the slope position classifications, high and low TPI values were distinguished by setting a threshold of ±1 SD. In cases where TPI values from both neighborhood sizes were between -1 and 1, small plains and midslope areas were distinguished by using a threshold slope value of 6°. A full description of each morphological classification can be found in Weiss (2001) and Jenness (2005). 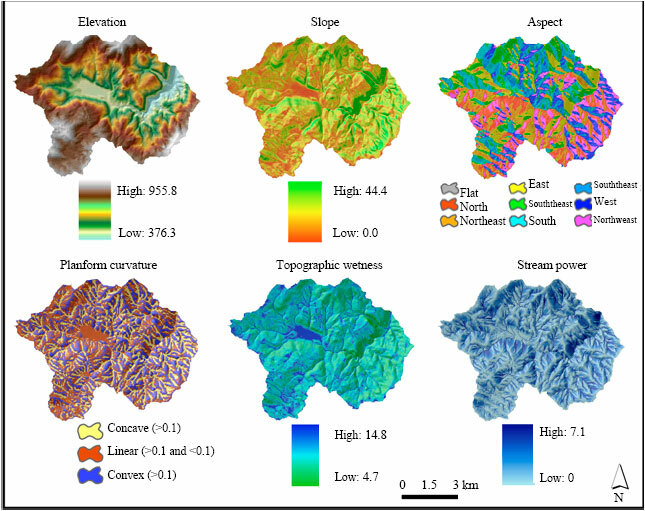 Relationships between landscape classifications (slope position and landforms) and topographic attributes (elevation, slope, planform curvature, topographic wetness and stream power) were determined by using the standard ArcView Zonal Statistics function to calculate statistics for topographic attributes within each landscape class. Relationships between landscape classifications and geology and landcover classes were analaysed by using the standard ArcView Tabulate Table function to calculate the proportions of landscape classes that corresponded with each geology and landcover classes. Slope position classification: From the 6 neighborhood sizes were tested, it was found that the 100 m neighborhood did the best job at extracting the terraces and small karstic depressions features interested in identifying within the watershed. These features were not large enough to be extracted by larger neighborhoods and the smaller 50 m neighborhood tended to extract only the edges of the features rather than the features themselves. The slope position classification results for all 6 neighborhood sizes are shown in Fig. 7. Within the 100 m neighborhood classification, 66,6% of the watershed was classified as Mid-slope, 14.4% Valley, 14.2% Hilltop and 10.8% was classified as Flat Surface. Topographic attributes of landform classes: Figure 8 provides an overview of the area with the primary landforms. More than 50% of the area is classified as open slope, which is not surprising because is the area is intersected with several rivers. Slope, topographic wetness, stream power, planform curvature and elevation characteristics of the landforms are shown in Table 2. 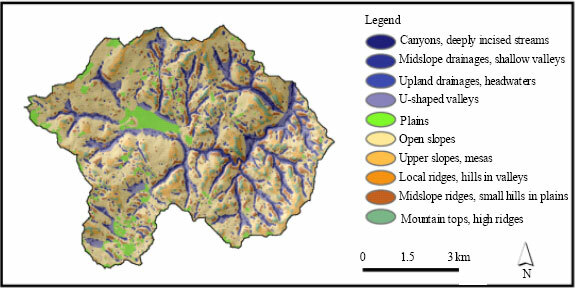 It is interesting to note that the classes Canyons, Deeply Incised Streams, Midslope Drainages, Shallow Valleys and Upland Drainages, Headwaters all tended to have strongly negative planform curvature values, while Local Ridges/Hills in Valleys, Midslope Ridges, Small Hills in Plainsand Mountain Tops, High Ridgesall tended to have strongly positive planform curvature values. The classes with negative curvature values all corresponded to negative small-neighborhood TPI values, while the classes with positive curvature all corresponded to positive small-neighborhood TPI values. Curvature is always calculated from a 3×3 cell neighborhood, so curvature in our example was calculated using a square 60 m neighborhood. This neighborhood size is very close to our 50 m radius circular TPI neighborhood, so it is not surprising that planform curvature tends to be appears to be correlated with our small-neighborhood TPI grid. Stream power is directly related to both slope and catchment area, so it is also not surprising that stream power was strongest where either the small-neighborhood or large-neighborhood values were negative. Negative TPI values indicate that a cell is lower than its neighbors and such cells would be expected to have a larger catchment area than cells that are higher than their neighbors. Geologic and landcover characteristics of landform classes: As seen in Table 3, 92.8% of alluvial surfaces were classified as U-Shaped Valleys, Plains or Open Slopes (i.e., the three highest values: 17.6+ 58.9+ 16.3%), 59.5% of the agglomerates were classified as open slopes and upper slopes; 88% of the sandstones, mudstones and limestones were classified as open slopes, midslope ridges, small hills in plains and plain small and 48% of limestones were open slopes. This is evidence that geology has great importance on landforms of the watershed. Landcover classes also demonstrate interesting relationships with landform classes (Table 3). Canyons and deeply incised streams appear to have a lot of forest; plains have a lot of bare rock and exposed soil, upper slopes appear to have relatively little bare rock and exposed soil; local ridges/hills in valleys appear to have a lot of forest and relatively little bare rock and exposed soil and mountain tops/ridges appear to have a lot of forest and relatively little bare rock and exposed soil. The hugely disproportional amount of bare rock/exposed soil found in plains may be accounted for by the fact that these areas are primarily agricultural and the bare rock/exposed soil class includes agricultural areas. Three different erosional or denudational surfaces can be identified using TPI. These denudational surfaces were identified as Upper Slopes, Mesas in the Weiss landform classification scheme. The lowest level denudational surface was observed at 100-150 m relative height. The mid-level denudational surface is found between 250 and 300 m relative height and cuts the Miocene - Pliocene volcanic formations. The highest level denudational surface is found at 400 m relative height, at the border of the watershed (Fig. 9). According to Erol (1983), the lowest surfaces date to the Lowest Pleistocene period; the mid-level surfaces are from the Pliocene period and the highest surfaces date to the Upper Miocene period. The depression formation in the centre of the region is known as Yazoren Polje, a primarily agricultural area. This flat surface was identified as a plain in the Weiss landform classification scheme. The plain transitions rapidly to open slopes along the northern and southern boundaries This sudden slope change, located along the normal fault lines illustrated in Fig. 3, suggests that normal faulting may contribute to the depression formation. The plateau along the northern border of the polje rises 100-150 m relative to the depression and the southern border of the polje is bordered by a plateau rising nearly 200 m relative height (Fig. 2, Fig. 9a-b). This 100 m difference is likely the result of uplifting along the normal fault. It is hypothesized that Yazoren Polje and its watershed have been drained by the gorge at the elbow of capture. According to Ardel (1958) and Kazanci and Gorur (1997), the Pleistocene is a erosional period in the Southern Marmara region of Turkey and closed depressions are open with epigenetic gorge or superposed valley in the Southern Marmara region of Turkey. According to Erol (1992) and Atalay (1998), Pleistocene climatic change led to different terrace systems and down cutting began in the lowest Pleistocene and continued through the low, middle and late Pleistocene. This capture process, occurring because of the ongoing uplift and compression of the landscape, has been historically common in the Marmara region of Turkey (as well as throughout Turkey in general) as Neotectonic activities and Quaternary sea level fluctuation largely control the development of this region. The river incised its valley during the Quaternary period and thus played a major role in the development of the landforms present in the area today (Atalay, 1998). Two shoulders or narrow terraces along the slopes of the gorge can be identified with TPI (Fig. 8). Terrace surfaces are found along local ridges or mid-slope ridges. It appears that the gorge was incised over a very long time. The terrace around the gorge observed by myself at 60-70 m above the floodplain; lowest one is observed at 20-30 m above the floodplain (Fig. 9c-e). These same terrace surfaces were identified by Tagil (2004) near the Balikesir plain, the nearest plain located 28 km in NE direction. The lowest terrace could not be determined in the gorge itself, but it is apparent at the entrance and exit of the gorge and also in the southern part of Yazoren Polje. Because the capture gorge cut into the Yuntdag volcanics of the Late Miocene to Pliocene age, the capture therefore occurred after the Pliocene. This suggests that the capture and gorge were formed during and after the Pleistocene. The landform application can help us to detect not only open depressions but also closed depressions, river channels and less obvious features such as vales. Figure 8 shows several closed karst depressions (Kizilgol pit and lots of unnamed depressions) that were misclassified as deeply incised streams and U-shaped valleys. Sharp edges mark the boundaries of these karst depressions. While the interior lower level area is classified as flat or plain, the areas around these small depressions are classified as open slopes due to its elevated position compared to the depression bottom. The smallest of these karstic depressions are nearly 500-1500 m in diameter and 150-500 m in length. They vary in size. Landscape surveying and mapping techniques based on geomorphologic analysis, combined with GIS and remote sensing techniques, are useful tools for natural resource management. In this study, TPI was used to generate morphological types for a semi-automated derivation of landform elements. With the presented methodology landform elements have been generated according to Weiss (2001) and the results reflect his definitions. Digital elevation models offer many potential habitat descriptors other than simply a set of elevation values. DEMs can yield a wide variety of landscape morphological characteristics which may be important to wildlife, land managers and researchers. This article describes some of the analytical approaches and topographic concepts and shows how they are useful to explain geomorphological processes. There are occasionally problems with this method. In this semi-automatic landform model, smaller creeks got lost or were at least poorly identified. For example, narrow creeks running across wide flats without forming a broader valley were not identified, although they might be identifiable using more sensitive classification criteria. Some areas simply cannot be handled correctly by the computer if they extend beyond the boundary of the DEM. Except cases such as these: TPI provides a powerful tool to describe topographic attributes of a study area. Ardel, A., 1958. Structure and relief of Marmara region and problems. Turk. J. Geogr. Res., 2: 20-30. Atalay, I., 1998. 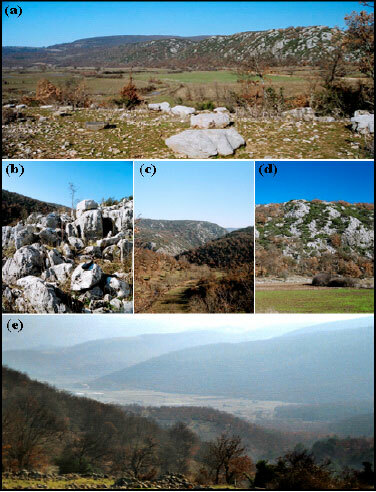 Paleoenvironmental Conditions of the Late Pleistocene and Early Holocene in Anatolia. In: Quaternary Deserts and Climatic Change, Alsharhan, A.S., K.W. Glennie, G.L. Whittle and C.G. St.C. Kendall (Eds.). A.A. Balkema Publication, Balkema, Rotterdam, ISBN9054105976, pp: 227-237. Bates, R.L. and J. Jackson, 1987. Glossary of Geology: Alexandria, Virginia. 1st Edn., American Geological Institute, New York, pp: 788. Blaszczynski, J.S., 1997. Landform characterization with geographic information systems. Photogrammetric Eng. Remote Sens., 63: 183-191. Chorley, R.J., 1972. Chapter 1-Spatial Analysis in Geomorphology. In: Spatial Analysis in Geomorphology, Chorley, R.J. (Ed.). Harper and Row Publishers, New York, USA., pp: 3-16. Coates, D.R., 1958. Quantitative geomorphology of small drainage basins in Southern Indiana. 1st Edn., Columbia University, New York. Denizman, C., 2003. Morphometric and spatial distribution parameters of karstic depressions, lower Suwannee River Basin, Florida. J. Cave Karst Stud., 65: 29-35. Djokic, D., Z. Ye and A. Miller, 1997. Efficient watershed delineation using ArcView and spatial analyst. Proceeding of the 17th Annual ESRI User Conference. San Diego, CA. ESRI., 1997. Watershed Delineator Application-User's Manual. 1st Edn., Environmental Systems Research Institute, Redlands, CA. Ercan, T., E. Ergul, F. Akcoren, A. Cetin, S. Granit and J. Asutay, 1990. Geology of Balikesir-Bandirma. MTA. Bull., 110: 113-130. Erol, O., 1983. Neotectonic and geomorphological evolution of Turkey. Jeomorphol. Bull., 11: 1-22. Erol, O., 1992. Climageomorphology. 1st Edn., Printing House of Istanbul University, Istanbul, Turkey. Evans, I.S., 1972. Chapter 2-General Geomorphometry, Derivatives of Altitude and Descriptive Statistics. In: Spatial Analysis in Geomorphology, Chorley, R.J. (Ed.). Harper and Row, Publishers, New York, USA., pp: 17-90. Fels, J.E. and R. Zobel, 1995. Landscape position and classified landtype mapping for statewide DRASTIC mapping project. North Carolina State University Technical Report. Franklin, S.E., 1987. Geomorphometric processing of digital elevation models. Comput. Geosci., 13: 603-609. Horton, R.E., 1945. Erosional development of streams and their drainage basins: Hydrophysical approach to quantitative morphology. Geol. Soc. Am. Bull., 56: 275-370. Hosgoren, Y., 1981. A Karstic Area in the Northern part of Aegean region. Stanbul Earth Sci. J., 2: 139-148. Jenness, J., 2005. Topographic position index (tpi_jen.avx) extension for ArcView 3.x. Jenness Enterprises. http://www.jennessent.com. Kazanci, N. and N. Gorur, 1997. Neogene and quaternary evolution of Marmara region. TUBITAK, Project No. YDABCAG/426G, Ankara. Messina, J.P., K.A. Crews-Meyer and S.J. Walsh, 2000. Scale dependent pattern metrics and panel data analysis as applied in a multiphase hybrid land cover classification scheme. Proceedings of the American Society of Photogrammetry and Remote Sensing Conference, Miami, Florida, May 22-26, 2000, American Society for Photogrammetry and Remote Sensing, USA., pp: 1-8. Miller, J.C., 1953. A quantitative geomorphic study of drainage basin characteristics in the cinch mountain area. Virginia and Tennessee, Technical Report 3. Moore, I.D., P.E. Gessler, G.A. Nielsen and G.A. Peterson, 1993. Soil attribute prediction using terrain analysis. Soil Sci. Soc. Am. J., 57: 443-452. Pike, R.J., 1999. A bibliography of geomorphometry, the Quantitative Representation of Topography-Supplement 3 (Open-File Report 99-140), US. Geological Survey. Skidmore, A.K., 1989. A comparison of techniques for calculating gradient and aspect from a gridded digital elevation model. Int. J. Geogr. Inform. Sci., 3: 323-334. Speight, J.G., 1990. Landform. In: Australian Soil and Land Survey Field Handbook, McDonald, R.C., R.F. Isbell, J.G. Speight, J. Walker and M.S. Hopkins (Eds.). 2nd Edn., Inkata Press, Melbourne, pp: 9-57. Tagil, S., 2004. Physical Geography of Balikesir Plain and Its Surrounding. 1st Edn., Anil Printing House, Ankara, Turkey. Tekeli, O., 1981. Subduction complex of pre-Jurassic age, northern Anatolia, Turkey. Geology, 9: 68-72. Ventura, S.J. and B.J. Irvin, 2000. Automated Landform Classification Methods for Soil-Landscape. In: Terrain Analysis: Principles and Applications, Wilson, J.P. and J.C. Gallant (Eds.). John Wiley and Sons, New York, pp: 267-93. Weiss, A., 2001. Topographic position and landforms analysis. Poster Presentation, ESRI User Conference, San Diego, CA. Wilson, J.P. and J.C. Gallant, 2000. Digital Terrain Analysis. Terrain Analysis: Principles and Applications. 1st Edn., John Wiley and Sons, New York, pp: 1-27. Zevenbergen, L.W. and C.R. Thorne, 1987. Quantitative analysis of land surface topography. Earth Surface Processes Landforms, 12: 47-56.